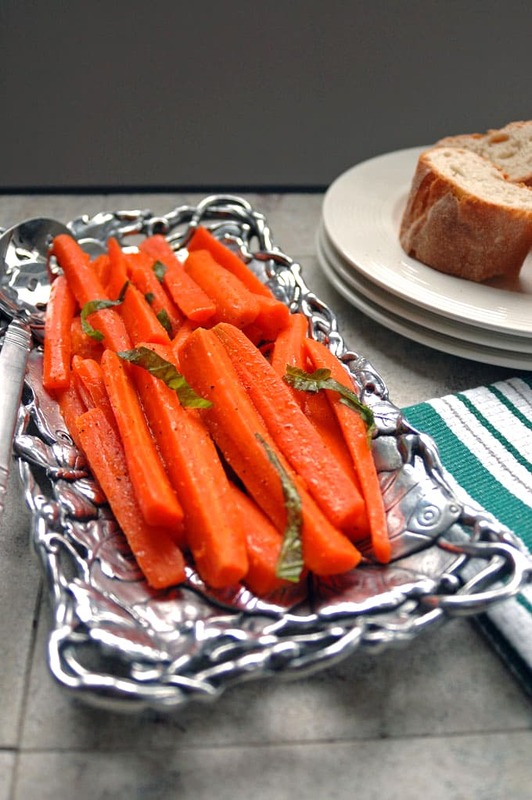 Italian Carrot Salad with Basil is a delicious family favorite with oil and vinegar! A vegan & gluten-free side dish. Happy New Year! I had no idea this would be my first post of 2016, but after all of the rich food during the holidays, I had such a craving for our family’s Italian carrot salad with basil. Forget meat, cheese, and anything heavy or sweet — for now. 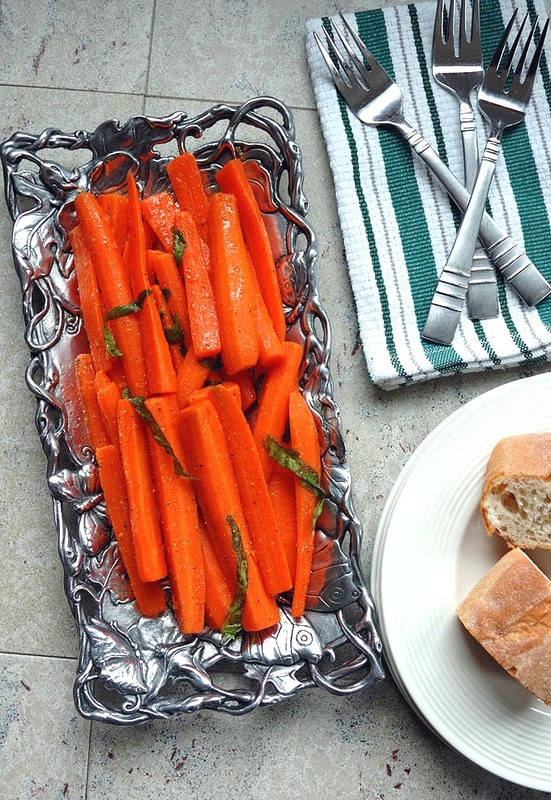 I just want to settle in with a bel piatto (beautiful plate) of these gorgeous carrots and some crusty bread to soak up the delicious oil and vinegar dressing. Does that sound good? Mom always tells me that the best Italian food consists of just a few simple ingredients. (Isn’t that a great recipe for life too?) Here, we have crisp-tender carrots, a red wine vinaigrette and basil coming together to make magic. Here’s to all of us in 2016. May our year be bright, healthy and delicious! 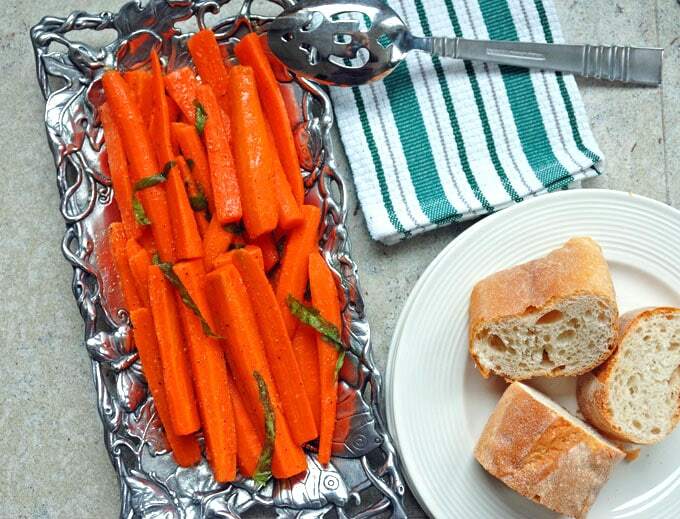 Italian Carrot Salad with Basil is a delicious family favorite with oil and vinegar! A vegan & gluten-free side dish. Fill a large pot 2/3 full with hot water. Set it on the stove over high heat and add a couple teaspoons of salt to the water. Cover the pot. While your water is boiling, rinse and peel your carrots. Trim off and discard the ends. Cut each carrot in half so that it is 3-to-4 inches long. Cut each piece in half the long way to make the carrots thinner. If you have a thick carrot, you might want to cut it in half again the long way. While the carrots are cooking, stack your basil leaves and roll them tightly into a cylinder shape. Slice your cylinder of basil into pieces about 1/4 inch wide. This will give you ribbons of basil (chiffonade). When the carrots are done, drain them in a colander in the sink and run some cold water over them to stop the cooking. 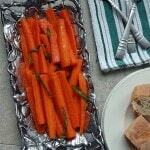 Transfer the carrots to your serving bowl and add the rest of the ingredients. Gently toss everything together with two spoons. Serve at room temperature. (You can make it one or two hours ahead of time and let it marinate at room temperature, if you wish.) Store leftovers in the refrigerator for up to five days. Happy New beginnings 2016-You know carrots are a personal favorite of mine-I love them! Raw, Cooked, Roasted, Sauteed you name it I am first in line for them-Woo Hoo my friend. Oh I love this post Andrea! Perfect timing for eating more healthy, colorful to enhance gloomier days of winter, simple and perfectly Italian! And lastly, your mother is right! Aren’t mothers always right when it comes to Italian cooking? I love your Arthur Court dish, I think I have the same one if it is in the butterfly or orchid pattern. I never use it often enough and it sure puts a sparkle to this dish and launching the new year! Thanks for sharing and may you have the happiest of new years! Roz, I just found your comment in my spam folder! I have no idea how that happened. Yes, my mother is always right…about Italian cooking! I love that you have the same Arthur Court dish with the butterflies and orchids. It was a gift, and it does add a special touch to the food! Happy New Year!